If you are missing multiple teeth, dentures may be a suitable option for you. Dentures are removable prosthetic appliances comprised of artificial teeth. Dentures are custom created to replace missing teeth and the surrounding gum area, and are molded to fit a dental patient’s unique mouth structure. The artificial teeth are affixed to a plate that sits snugly against either the gum line or the roof of the mouth. Dentures can be easily removed to allow for daily cleaning and care. Many people are nervous to wear dentures because past models were ill-fitting and noticeable. Fear not, as today’s dentures look and feel more natural than ever before. There are a variety of reasons why patients are missing teeth such as a physical accident, the teeth never came in, or teeth were damaged by advanced stages of tooth decay. Missing teeth can happen to anyone which is why patients of all ages can have dentures. Dentures allow wearers to speak, smile, and eat comfortably without worrying about dental pain or damage. There are two main types of dentures: full and partial. Your dentist will help you choose the type of denture that’s best for you based on the amount of teeth to be replaced, as well as your budget. Full Dentures – Full dentures are used to replace all teeth of the upper or lower jaw. There are two full denture options: conventional or immediate. For either option, the remaining teeth need to be removed first. Conventional full dentures will not be inserted immediately after the removal of remaining teeth. Instead, measurements of the mouth will be taken to create a custom denture specifically designed to fit the patient’s mouth. The oral tissue will need time to heal before the custom created dentures can be inserted. It may take several months for the patient to receive the conventional full denture. For many, this option is undesirable due to the length of time without teeth. Immediate full denture sets are inserted immediately after the remaining teeth are removed. While you never have to be without your teeth, these dentures must be realigned several months after being inserted. The bone and gums will move while healing, which can loosen the denture fit. Partial Denture – A partial denture is used when a patient is missing a section of teeth. Partial dentures rest on a metal framework attached to your natural teeth. Dentists will often place crowns on select surrounding natural teeth to serve as anchors for the denture. After a physical examination, x-rays, and consultation, the dentist will assess your dental needs to determine if dentures are the right solution for you. At this time, your dentist may advise you on additional procedures required to proceed such as the removal of any diseased or damaged teeth. If your dentist provides denture services, an impression will be taken of the hard and soft tissues in your mouth using trays. Once the impression hardens, a cast will be created. This cast will be unique, a replication of your mouth, and will be used as a mold to create your dentures. Once the impression is made, the cast and mold will either be created in-house or in an off-site dental lab. Denture manufacturing has become so skilled that most people cannot tell if an individual is wearing them. The tooth color can be specially matched to existing teeth. If there are no teeth left, a natural tooth color will be applied to the dentures. The non-tooth portion of the denture will be color-matched with the oral tissues in the mouth. Your dentist will want to check your dentures from time to time, checking the fit. Small adjustments may be needed to ensure your comfort, including filing the edges of the appliance. Once you receive your dentures, it is very important to be diligent about the care and maintenance. Just as you wouldn’t throw your glasses on the floor or toss a prosthetic limb behind the couch, your dentures need to be carefully stored when not in use. Special denture-soaking trays and containers can be purchased at most grocery stores. Dentures should be placed in these trays for cleaning each night. Denture cleaning solutions, often available in either a liquid or tablet form, are designed to remove stains and food particles accumulated throughout the day. Similar to natural teeth, problematic “hard” foods should be avoided. Chewing ice or hard candy with your dentures can cause damage. Dentures could chip or crack and may result in a traveling crack down through the base plate. A damaged base plate will break the denture in half. If you experience any problems or damage your dentures, contact your dentist right away for a repair or refitting. 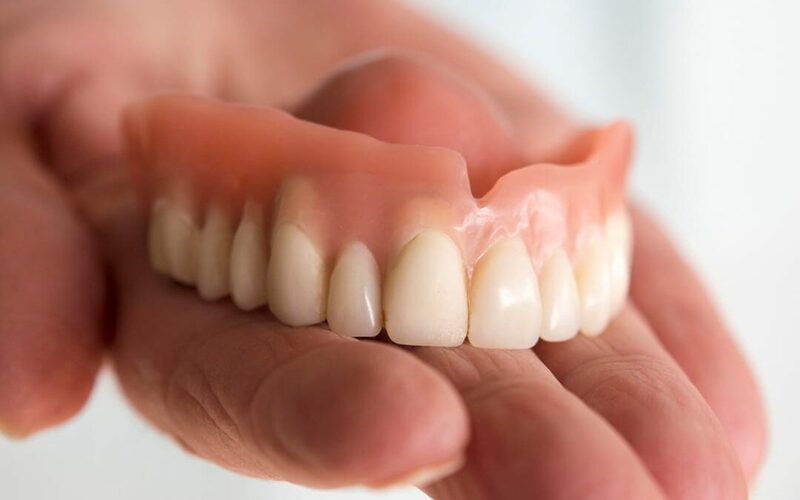 With proper care, a set of full or partial dentures should last you for many years, however, they may need to be readjusted for comfort or fit if your jawbones shift or additional teeth need to be removed. Those who wear dentures can still enjoy an excellent quality of life, so whether you need a set due to tooth decay, disease, trauma, or age, talk to your dentist for a new set of strong, attractive teeth.